Pat McAfee, who recently retired from the NFL’s Indianapolis Colts at the age of 30 as their punter, had become a favorite of many sports fans for his on-field antics — like his awesomely long celebration after a great punt against the Jets where he went all Razor Ramon on ’em — and amazing social media presence — particularly after the firing of the polarizing former Colts general manager. 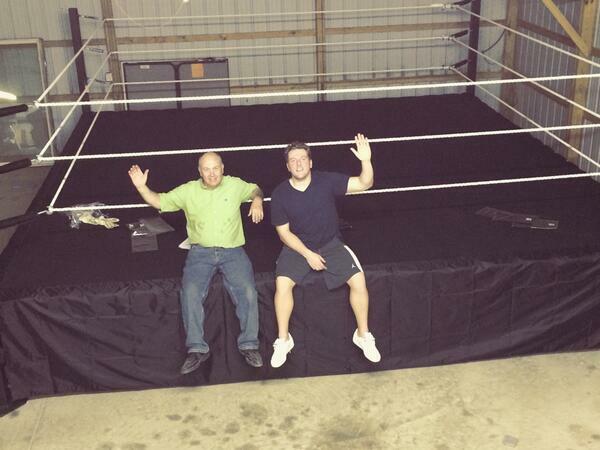 For the next phase of his life, he’s developed a blossoming stand-up career, and he even built himself a wrestling ring, and has recently taken some advisory meetings with Rip Rogers, a veteran wrestler and head trainer of former WWE and TNA development promotion, Ohio Valley Wrestling. If the name Rip Rogers sounds familiar to you, he kickstarted the recent conversation about (what he feels is) the rapid pace of independent wrestling matches today. You may also be familiar with WWE star Randy Orton inserting his opinion in the conversation as well. Regardless of that, if you’re looking to break into the business of professional wrestling, having Rogers as your guide and trainer and an excellent decision. Bonus: Here’s a McAfee’s match from 2009 with a post-match interview!